Exception: If pup is found by a vet ( valid paperwork by veterinarian required) to have a congential defect is the only way to be refunded. You will be asked to sign a form on this so please understand once you have this puppy you cannot return for a refund ! $200.00 NON - REFUNDABLE DEPOSIT IS REQUIRED TO RESERVE A PUPPY!! 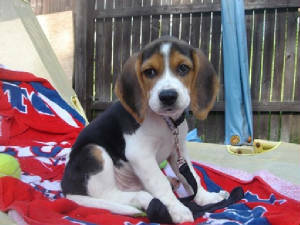 Adoption Fee of a puppy with first shots,puppy packet etc is $950.00 per puppy male or female. The deposit is due once the puppy is picked and then the balance of $750.00 is due when thier six weeks old. WE DO NOT AIR SHIP OUR PUPPPIES. Personal & Electronic checks will require to "clear bank" before you can pick up your new puppy. THE BALANCE IS DUE WHEN THE PUPPIES TURN SIX WEEKS OLD. Payments: We accept cash, credit cards, paypal & personal checks. Health: Puppies are guaranteed to be in good health with a veterinarian record provided , we provide first shots for puppies included in the price. pick up. Any pup that is neglected/mistreated ( in case of abuse you will forfeit your rights of ownership). Any pup you feel you can no longer care for and are thinking of abandoning please contact me . AKC PAPERS: These are all AKC beagles and will come with papers so you can register your new puppy however; they will have limited registration which means ( you will not be able to AKC register any litters whelped under your ownership). 1. DURING THE TIME ON THE LIST: I am requiring everyone to keep me updated during the time there on a list , every two weeks by sending a quick email is fine, ( important to watch the website! )ANYONE WHO FAILS TO KEEP IN TOUCH BY EMAIL , I will take you off the list automatifcally so please understand it is in your best interest and important. 2. Unfortunately because alot of people have been to inconsiderate to let me know they found another puppy, there circumstances changed , etc . These changes need to be made and applied. It is UNFAIR to those how are waiting after you who could be moved up the list. 3. Once I ANNOUCE on this website/facebook that I will be calling ( will now attempt two phone calls to make it fair), you have ONE DAY ( the day I ACTUALLY called ) to contact me back(if you should have been contacted but were not because your at the top of the list (within the first 8), call me instead or email, maybe I have the wrong phone number. Email, facebook, phone ,courier pigeon, text my cell if you have too , find the two minutes to tell me you know and if there is reason you cannot talk at the time , inform me. I'm leaving it up to you to be deligent at the time to contact me. If I do not hear from you in that day you will lose your spot on the list,of course you will able to have the option of adopting again. 4. If there is a list, you know you are on list , be prepared to pick out a puppy immediately( as within few hours) BY INTERNET PICTURE) , inform me if you need more time and that is at *my discretion*. I understand some of you want to wait until there five weeks to see there personality;however that is not possible for my puppies ,and you need to look elsewhere. There are times a puppy becomes available when an adoption fall through or a litter does not get adopted within a few weeks but that is RARE. 5. I did this to be fair to people , if it works I will stick with these terms, if not I will make changes. Hope you all understand it's in both are interests and good luck !